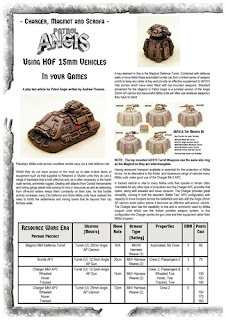 Back in the spring I was contacted with an idea to use the Charger APC's, Scrofa AFV and Maginot Tower from the Alternative Armies 15mm science fiction range called HOF in games of Patrol Angis. After all, I thought, there may well be a world in the Prydian Precinct that uses vehicles like those for local law or planetary defence forces. 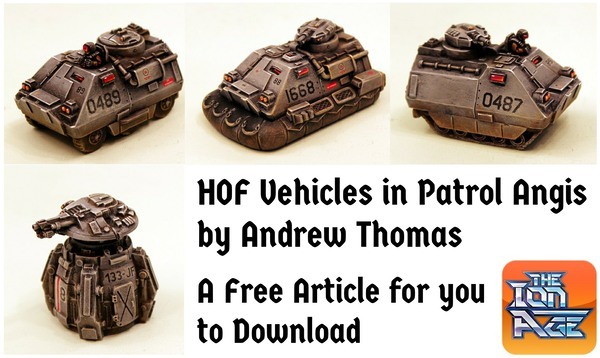 Andrew Thomas was kind enough as a fan of Patrol Angis to send over some play test rules for such an event and it is our pleasure to give you these as a free article. Read on for more. This free article gives you some introduction along with game statistics to use Alternative Armies 15mm scale sci-fi vehicles and structures in Patrol Angis. To download it from our dropbox please click HERE. With kind permission I have been able to put the codes featured onto The Ion Age website so that if you are keen to get them with your Ion Age reward points in your customer account you can! Go HERE for them. Frankly it is my thinking that these are the ancient ancestors of the vehicles such as the Adder, Mullo and Taranis. Since the Resource Wars of 21st century Terra are part of the history of The Ion Age and the Security Force Alpha which these in HOF come from is part of those wars. But then of course that was all before the Imperial Commonwealth. During July 2017 you get IMP47 Happy Burger Bin Bot free in every order placed. You can also get it on its own and there is a great pack of all four Happy Burger bots which are great for any 15mm setting. I love Happy Burger! Go HERE for this. This is the last news from us in July and the next thing from us will be on the 1st of August with a big announcement alongside the last monthly free miniature IMP48 (end of year four). My thanks to Andrew for his work on this excellent little article.